Millikin’s football team has experienced backlash since Sept. 24, the day certain football players participated in the peaceful protest against injustices in our society by kneeling during the playing of the national anthem. 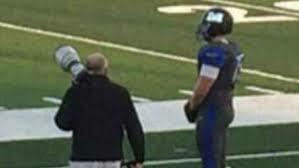 A Millikin player, Connor Brewer, snuck out of the locker room and stood alone during the National Anthem. A photo was taken and the story was reported. That story was taken out of context. One article in particular by Todd Starnes, a Fox opinion piece, titled “Football Player Stands Alone to Honor America” displays a critical subjective opinion of what he believes transpired on Oct 15, 2016, when Brewer stood alone during the national anthem. So here’s what we know, as Millikin University students, compared to Todd’s emotional rant which lead him to perceive Brewer as an American patriot. The following italicized sentences come from an article by Todd Starnes. In many ways, we can look at this statement and think “true, Millikin did protest the anthem, and Millikin did stay in the locker room.” That is a statement that comes from someone who does not know the full story. Millikin University released a statement prior to the Oct. 15 game, stating that players would stay in the locker room for the anthem, which was a unanimous decision made by the team; including Brewer. The idea behind staying in the locker room was to prevent any controversy that may or could have transpired due to players who wanted to stand or take a knee. What some aren’t aware of is that Millikin’s football team never stepped foot into the locker room. In fact, the team stood united in the Griswold Gymnasium where a United States flag hangs. Many players, with their hands over their heart, stood and respected the national anthem as it sounded from the football field only a few feet away. Who says Kaepernick is a disgrace? He exercised his rights as an American citizen. As we continue to check the facts, we also would like to stress the fact that by a person not acting or engaging in activities that are NOT similar to yours, doesn’t mean your actions are wrong or that others believe you don’t have the free will to express those actions. Students took a knee in a previous game, and they have the freedom to do so, just as Brewer had the right to stand for the Anthem. Here’s the defining question of this entire situation: Is anyone in the wrong? The answer to that is personal and calling those who disagree with your opinion a coward, or worse, shows less respect for this country than not allowing someone to exercise their constitutional rights. Not a single player burned a flag, spit on a soldier or cowered in the locker room. Patriotism, as defined in the dictionary is “devoted love, support and defense of one’s country; national loyalty.” In many ways, the players on Millikin’s football team were doing just that as they defend a nation we call “Big Blue.” As an athlete, team means family, and for so many of Millikin’s football players, their main goal is to win TOGETHER! Millikin football team defeated Augustana College after losing to them the last 6 years. Last year’s records show Augustana beating Millikin 42-10. As communication students here at Millikin University, our knowledge of media and its manipulation leads us to one thing and that is seeking the truth. Despite what the media wants us to believe, truth is not overrated. Millikin University released a statement Friday, Oct 14 stating the university came to an agreement to do nothing that could be seen as disrespectful to one’s sacrifices made during their time of service. Millikin did not protest the anthem, and no one was forced to stay in the locker room. In so many words, every player on that team had the freedom to stand for the anthem, on that field. Brewer is a player who practiced the freedom that we all have just like the rest of his teammates who stood united. A photo was captured of Connor that spread across the web worldwide. Media took its course and, as so many times before, misconstrued the truth. That’s the truth… a little different from Todd’s story huh? As a student body, we respect and stand behind our university and the decisions they make, which is the number one reason we will not sit by and let others mistreat or disrespect anyone from our Millikin family. The unfair assumptions made by others about Millikin football and our institution as a whole should not define what Millikin stands for. Over the last several days our athletes have received death threats from strangers, have been looked at differently by their friends and family, and found that what once was a team united, is now struggling to avoid segregation due to frustration and cultural differences. Stories like Todd’s cause problems in communities and contributes to the division that our country is experiencing. For years, Millikin football has been seen as a laughing stock to the community and to the CCIW conference. The success they have seen this year is far greater than any one headliner or photo. The question again is this: “Why is this event over shadowing their success?” Nicco Stepina threw for 6 touchdowns as a sophomore, the night the conversation began. These are the kind of things that Millikin Football should be represented under. As a university, we will continue to stick together during this time of injustice on both sides, and will be better prepared for the future. Considering the game took place Oct 15, I’m sure historians would not have much to comment on. It’s important to double-check your work Todd. thank you. just…. thank you. I was proud before, and I’m even more proud now. As an alum, I’m embarrassed by the fact Millikin has silenced all opposition. Banning people from university websites such as alumni who oppose the University’s stance is suppressing opposition. The fact that alums who have either donated or went out in the community representing Millikin with pride has been wiped away because you disagree with them certainly isn’t practicing debate. I was silenced once as a student at Millikin and I repeat I will not let it happen again. Very well said!! Thank you. As a neighbor and parent of a Millikin student I commend the university, football team, and Millikin students for their stance. Thank you for being good Americans and standing up for liberty and justice for all. I will show my respect by staying home and not bring my son to the colleges football games. Wish this one young man the best in life. Let the rest of the team go over seas and see how it really is in a third world country then when they come home tell me if they don’t stand. See someone lose their life so you can play a game safely in your country, then you can talk. Great article! We are proud our son plays on this football team. They have made so much progress & grown as a team this year! Thanks for writing the true facts! GO BIG BLUE! I completely disagree. Whether this team refused to stand or refused to take the field, the result is the same. An expression of “protest” by insulting the very country that protects your civil rights, including free speech. It’s like biting the hand that feeds you and does NOTHING to bring positive attention to their “cause”. There are a million ways to effectively protest in our country. THIS only served to make the team and their coach look foolish. Their coach should be ashamed. He could have guided them to a more effective way to express their concerns. Instead he jumped on the latest “viral” -trend without thoughtfully considering the consequences…to his team and to his university. This has served to damage the credibility of ANY “cause” that chooses to use this method of so called “expression”…now and in the future.